Arriving in theaters today is the highly-anticipated film, pilule The Hunger Games. Starring Jennifer Lawrence and Josh Hutcherson, remedy the movie is an adaptation of the first in a series of books written by Suzanne Collins. In adapting the book into a motion picture, it was inevitable that some characters would be removed, some dialogue would be edited out and several scenes would be deleted. Fortunately, Collins– who has publicly praised the film— wrote the screenplay alongside director Gary Ross and Billy Ray. With that in mind, the film captures much of the main story but there are some major big differences between the book and the movie. With that in mind, we’ve come up with a list of ten big differences between the two. If we’re missing any major differences, please let us know in the comments section and as always, “may the odds be ever in your favor.” WARNING SPOILER ALERTS: THIS PIECE CONTAINS MAJOR SPOILERS ABOUT THE FILM. 10.) In the book, Gale Hawthorne is Katniss Everdeen’s best friend in District 12, the poor district on the outskirts of the country. The two hunt together and divide up the game that they catch. Although there’s no overt romance in the relationship, Katniss continually evaluates her feelings for him. But when she is sent to compete in the games– where she faces off against twenty-three intense competitors– Gale is left behind. While Katniss thinks about him during the games, the book never shows him after the games begin. In the film, however, the first-person narrative is changed to a third-person narrative so viewers will see what Gale (Liam Hemsworth) is doing as his friend competes. We watch as he desperately longs for his friend and notices that she’s developing an onscreen relationship with fellow tribute, Peeta Mellarck…. 9.) During the games, many youngsters inevitably get killed. In the book, some of these deaths are prolonged showing the perseverance some of these characters have in their final moments. For instance, in an early scene, Katniss makes camp near a young woman who starts a campfire. After the young woman is discovered, she is attacked and nearly killed by some of her fellow tributes. But when they discover that she’s survived the attack, Peeta is sent to finish the job. And in the conclusion of the book, Cato– facing off against a group of mutant mutts– survives for several hours before Katniss puts him out of his misery. In the movie, however, these deaths are done quickly. It’s possible that the deaths are abbreviated in order for the film to earn its PG-13 rating. But regardless, the film finds the bonfire girl dying quickly and Cato only suffering for only a few moments before Katniss ends his life. 8.) Before she is sent to the Capitol to fight in the games, Katniss is visited by several of her loved ones. Gale, her mother and her younger sister come say good-bye. But, surprisingly, Peeta’s father comes to visit as well and offers Katniss cookies. Although the local baker doesn’t know Katniss well, he has always been kind to both her and her younger sibling. Later on — in a spout of possible paranoia- Katniss throws away the cookies. The film doesn’t include these scenes at all. Most readers might not care about this exclusion but it stood out to me because these short sequences show a connection between Peeta’s family and Katniss. Although the two don’t know each other well, Peeta’s father supported both Katniss and her younger sister by buying fresh meat and food from them. Plus, Peeta’s parents have spoken to Peeta about Katniss several times- as Peeta notes later– even though Peeta and Katniss were never close. 7.) Rue is the youngest person in the hunger games. As a tribute from District 11, she is forced to compete with older teenagers that are much stronger than she. During the training sessions, she develops an appreciation for Katniss and the two form an unlikely alliance in the games themselves. Katniss is particularly interested in protecting Rue because the young competitor reminds her of her younger sister. When Katniss sister’s Primrose was chosen to compete, Katniss stood up to take her place but no one volunteered to take Rue’s place so Katniss feels a certain solidarity with her. In the movie, the connection between Rue and Katniss’ sibling is glossed off. The two still form an alliance– of course- but Katniss’ empathy for her is never fully discussed in the film. 6.) Because the book is told in the first person and the movie is a third-person narrative, readers don’t get to meet some of the characters featured prominently in the movie. For instance, the game maker– who plays a very limited role in the book– gets a lot of screen time. Wes Bentley (American Beauty) plays Seneca Crane as an overconfident genius who takes pleasure in setting up the games themselves. His game, however, ultimately falls apart leading to a conclusion that has two tributes emerging from the battlefield, not one. Very little is made of this in the book but in the film, the game maker faces a great punishment for his failures. His fate is never revealed in the book but in the movie, he is left in a room with only poison berries to eat. In the same way that he set death traps for others to fall into, he himself is sent into his own trap to die alone. 5.) In the book, Haymitch is an alcoholic former champion of the hunger games from District 12. He arrives at the reaping– where Katniss’ sister and Peeta are chosen to compete– drunk and actually falls off the stage. In the movie, I don’t think he even appears at the reaping and if he does, he plays a very very small part in it. But, of course, he does ultimately appear and he helps train Katniss and Peeta for the games. The biggest difference in the film is how much a role Haymitch plays in saving the day. In the book, he pushes Katniss and Peeta to have a televised romance so that more viewers will root for them. But in the movie, Haymitch plays a larger role and pushes the game maker to focus on the budding romance. If not for Haymitch’s backstage manipulations, both Peeta and Katniss might not have survived the hunger games. But with him on their side, the two are able to survive, despite the odds against them and the rules themselves. 4.) In the book, we read as Katniss fights her way through the hunger games. We watch as she volunteers for the games themselves and as she prepares for them, with the help of Haymitch and her stylist Cinna (Lenny Kravitz). Once she is in the games, however, the focus is on her survival. But in the movie, many of the backstage machinations are revealed. Viewers watch as the producers of the game invent ways to keep the tributes close to each other. In this regard, President Snow (Donald Sutherland) plays a much bigger role in the film where he appears in several scenes discussing the games with Senaca. The film shows in some detail how much work is involved backstage in getting the games to play out in an entertaining and engaging fashion. 3.) If there is a villain in the actual games themselves, it is Cato. The cocky muscular tribute is an unrelenting killer willing to snap the neck of an ally if a plan falls apart. Towards the end of the film, the stage is set for a showdown between him and the Katniss/Peeta alliance. But before that, a District 11 tribute named Thresh saves Katniss’ life when he realizes how much she did to protect Rue throughout the games. After he saves Katniss, he is soon murdered himself. In the book, the assumption is that Cato has killed him. But in the movie, the suggestion is that Thresh has died at the hands of a group of dogs that the game makers have called into battle to help kill some of the remaining tributes. This difference– which may seem small– is actually quite important because Cato’s murder of Thresh in the book helped set the stage more intensely for the final showdown between the surviving tributes. 2.) One of the most important differences between the book and the movie is the absence of a minor character, who has an important back story with Katniss. My friend Kate Hicks, in discussing the film with me, actually had to point out this subtle but important difference. In the book, as Katniss is preparing for the games, she meets several individuals from the Capitol who serve her meals. One of those girls is an Avox– a traitor to the nation– that Katniss remembers from years earlier. Katniss remembers this girl as someone who was trying to escape from the Capitol but who was subsequently captured by the government. Labeled a traitor, her tongue was eventually removed. In the book, we learn the back story of this girl and how Katniss regrets not trying to save her when she had the chance. But in the movie, this relationship is never fully realized and Katniss’ connection to this girl is never revealed. 1.) Hands down, the biggest change between the book and the movie is the reaction to Rue’s death. In the book, Katniss receives a token of District 11’s appreciation for her kindness towards the young tribute but in the movie, the complete reaction of District 11 is brought into greater focus. After watching their young tribute die at the hands of a vicious killer, the people of District 11 begin to revolt against the military officials who watch over them. They fight against the government that has taken one of their own and sent her into a battlefield to die for their viewing pleasure. Although I haven’t read the second two books in this series, this fight against the Capitol will likely come into play in great depth later in the sequels. Of course, there are many other differences between The Hunger Games book and the film. Although it didn’t make my top ten list, another difference between the film and the book concerns the mockingjay pin that Katniss wears throughout the games. In the book, one character gives Katniss the pin but in the movie, another one does. This may be significant going forward but this minor change didn’t seem important in and of itself. But as the list shows, there are some major changes between the book and the film. Many readers will likely be pleased by this adaptation because it follows the story rather closely but others might be disappointed that the filmmakers made these and other changes to a story that they have so much affection for. Make sure you check out ScreenRant.com for this article and to learn more about The Hunger Games. 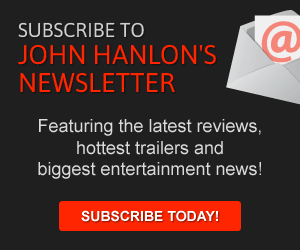 Also, make sure to follow me on Twitter @johnhanlon. Growing Pains actor Kirk Cameron thinks that America is off track. He’s concerned about our country’s future and he believes that we have to look to history to find “the secret sauce” that made our nation so great in the first place. With that in mind, decease his new documentary Monumental focuses on Cameron’s attempt to retrace our Pilgrim’s journey in order to better understand how our nation came into being. I recently had a chance to talk to Cameron about his new movie and the reasons he made it. Some see such problems and play the blame game but Cameron had another idea. “Instead of listening to everyone blame one another with the right blaming the left and the left blaming the right,” he decided to search for the keys to our nation’s greatness. He retraced the “escape route of the Pilgrims” and talked to historians about the tremendous obstacles that stood in their path as they fought for freedom. And as he notes in the film, the Pilgrims were far more courageous and resilient than many people give them credit for. “I want people to understand the recipe for freedom and blessing and prosperity and I want people to be inspired by the stories of courage and sacrifice and selflessness,” he added. And he was quick to note that “the history of the world is the story of people getting off track” so we are not facing a unique situation. History is full of people who took their history and freedom for granted, he said. And he argued that we can’t ever take those things for granted and we can’t wait for others to solve our own problems. “We shouldn’t wait around and wait for the government to fix the problems of our country…we should fix them ourselves.” And as a born-again Christian, he added that faith in God is a good place to start. In publicizing the film, Cameron has faced some tough questions about his own faith. While on Piers Morgan’s show a few weeks ago, the actor was confronted with questions about morality, homosexuality and abortion. And Cameron told me that he was unprepared for such questions and he was surprised how “disingenuous Morgan was.” Cameron told me that he went on the show to talk about his movie, not his personal religious beliefs. 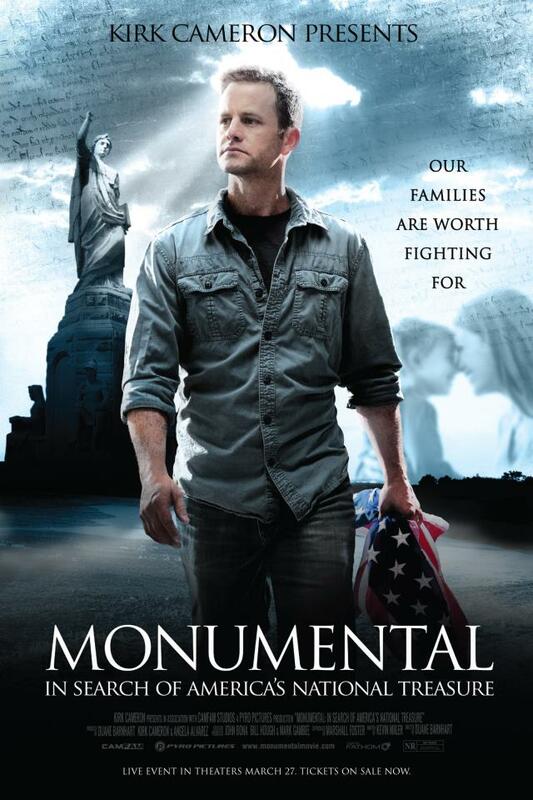 Cameron’s new movie Monumental will be screened tonight in limited theaters as a one- night engagement. 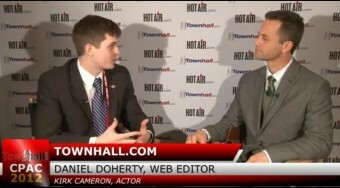 Click here to find a theater closest to you and also make sure you check out Townhall.com’s own Daniel Doherty interview Cameron at CPAC 2012. This interview was originally posted on Townhall.com.